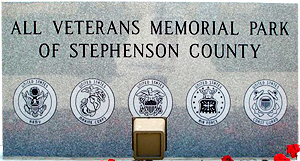 This park honors all of the veterans from Stephenson County. It contains large era stones from all conflicts. Benches surround concrete walkways, and a large brick memorial garden is featured. A Gold Star Family Memorial is dedicated to all who have given their lives for our freedoms.